If you own a local business or are managing the online marketing for one, you probably already realize that local SEO isn’t a walk in the park. While sharing the same basics, local SEO and non-geo-specific SEO are completely different from each other – the former being much more difficult than the latter. Constant changes and updates in Google algorithms don’t do too much to uncomplicated the task. In fact, even the most seasoned digital marketers may struggle with launching a successful local SEO campaign. So you wish to update and upgrade your local SEO campaign? It’s highly likely that you don’t know where to start. The good news is that this local SEO guide is going to help you master the art of achieving the top rank for a local search. You’ll get a thorough and uncomplicated walkthrough of the entire process – from understanding the factors that rank you locally to improving your strategy to gain top rank. You’ll even get a glimpse of how a better local SEO campaign will help you based on real-life examples. Read on to take your local business to the next level and stay ahead of your competitors using local SEO. What Factors Affect Local SEO? The study on local SEO ranking factors showed that Google My Business Signals like proximity, category, and keywords were the most important overall ranking factor at 19%. 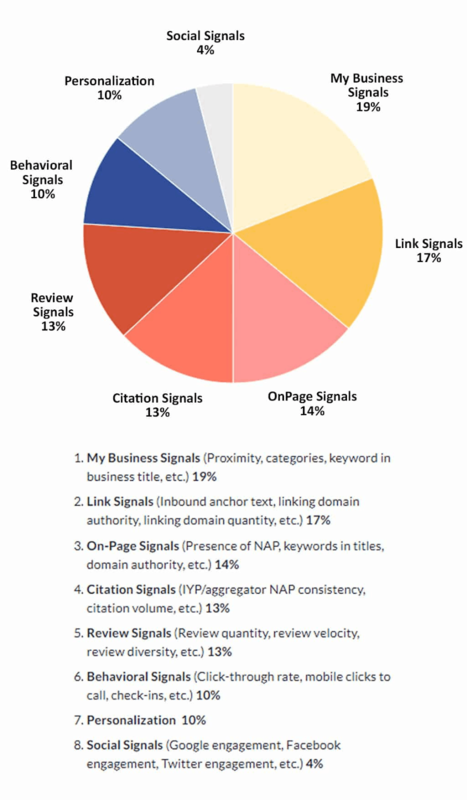 Link signals came in a close second at 17%; wherein factors like linking domain authority, inbound anchor text, etc. were considered. On-page signals were also very important at 14%; with factors like Domain Authority and NAP considered. So the most important factors for local SEO include the overall Domain Authority (DA) of your website. The higher your DA, the better your rank will be. Your keyword usage also plays a huge role in your ranking, so you have a better chance to rank higher if you use your target keywords in the title. This report shows that building quality backlinks is the way to go if you wish to boost your local SEO. Google will also take into consideration the DA of sites that link to you. If you’re getting linkbacks from suspicious sites, you might be unable to improve your rank. On the other hand, getting linkbacks from authority sites will increase your chances of getting a higher ranking and improve your local SEO. Additionally, the quantity of domains that link to you will also play a role in your local SEO. If you’re getting high volumes of linkbacks from mid-range to high authority sites, your chances of getting top rank will increase. The quality and quantity of domains linking to you is just as important as the anchor text they use to link to you. For a better chance to improve your local SEO, the inbound anchor text needs to be relevant to the topic and relevant to your business. For example, if you’re a Sacramento-based digital marketer, an anchor text of Sacramento SEO might prove to be a good anchor text. This is provided that it leads a blog post that guides readers to find good SEO experts in Sacramento. At the same time, if Sacramento SEO is your targeted keyword, using it as an anchor text isn’t the ideal option. Coming to localized organic factors, the Moz study reported that a website’s Domain Authority is a key factor for local SEO. While the quality and authority of inbound links coming to your website are also just as important. The third most important factor for local SEO, according to the study is behavioral signals. The click-through rate, click-to-call on mobile devices, and check-ins make a significant contribution. For the most part, the localized organic ranking factors the same as the overall ranking factors. They differ only slightly in their rankings. Other important local SEO organic factors are the diversity of inbound links that lead to your domain. The relevance of the geographic keyword to your domain content is also considered important. For example, using the keyword “Sacramento SEO” may be ideal if you’re a digital marketing expert based in Sacramento. When we’re examining the various ranking factors for local SEO, we also need to consider the factors that can negatively impact your rankings. The comprehensive report from Moz also considered all the negative ranking factors, which result in poor ranking in local SEO. Understanding these negative local SEO factors can help you understand how to correct and prevent them accordingly. It’s somewhat like how doctors need to diagnose an illness before prescribing medications and undertaking treatment procedures to cure the illness. One of the most prominent negative ranking factors for local SEO is choosing an incorrect business category for your Google My Business page. For example, your business deals with dental insurance, but if you’ve categorized yourself under “dental clinic” or “dental lab,” that could negatively impact your local SEO ranking. Google also considers your business address and contact information as critical ranking factors. So if it detects your listing at a false business address, it could bring down your ranking significantly. Similarly, mismatched NAP (Name, Address, and Phone Number) is another negative ranking factor for local SEO. The proximity of an address to the point of search is just as crucial a factor that can adversely impact your search ranking. If you consider all these positive and negative ranking factors, there are some important takeaways to apply to your own local SEO efforts. First of all, you now know that building quality backlinks should be a top priority if we wish to improve your local SEO. You understand that website signals like your Domain Authority affect your ranking. You also need to update your information accurately and according to the guidelines on Google My Business. You’ll find out more about how to do this for local SEO in the following section. Now that you have a better understanding of the factors that affect your local SEO, it’s time you take action. You will need to put in a lot of time and effort to improve your local ranking. Make sure you don’t give up too soon and you continue with your efforts until you see the desired results. Wondering how to improve local SEO? Here are some useful tips and techniques to help you out. You can also find more local SEO strategies to improve your local rankings. Before you get started with other local SEO steps, make sure that your page is verified. This will open up a number of optimization options for you, so prioritize on it before anything else. If you haven’t yet claimed your business, all you need to do is find the associated Google page and then click on the “Own this business?” link as you can see below. This will take you to the claiming process, which you’ll need to complete to improve your local SEO. Once completed, the “Verified” stamp should show up next to your business name when you’re logged into your business dashboard. If the verification cannot be completed this way, Google will give you other options to verify your business. You can do this either through an automated phone call or through postcard (this option may take a couple of weeks and isn’t recommended if there are other options available). Now the next step to improve your local SEO concerns correctly updating information about your business. This includes your business name, address, phone number, website URL, category, and hours of operation. Google also provides some basic guidelines to filling up this section correctly and boosting your local SEO. For starters, your business name on your Google My Business (GMB) page should be exactly the same as your real-world business name. This means that “XYZ Digital Marketing” cannot be named as “XYZ Digital Marketing – Best Sacramento SEO Experts” on GMB. The address on your page should be 100% accurate. Here’s what it will look like when you conduct a Google search. 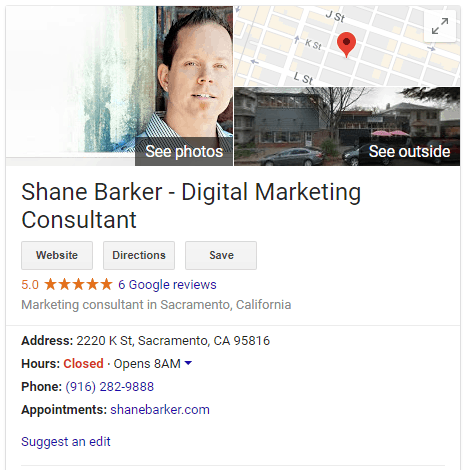 Notice how the name is only “Shane Barker Consulting” and nothing like “Shane Barker Consulting – Best Sacramento SEO Consultant”. You already know the importance of correct addresses for your local SEO. So make sure you avoid adding extra information like directions and cross stress, which may result in mismatched address affecting your local SEO. To find out the exact address of your business, you can use the online tool provided by USPS. Remember that P.O. boxes aren’t allowed by Google, so you need to use a physical address to improve local SEO. Your listed website URL should also match the homepage URL of your business website. As for your phone number, you need to update the local phone number you use for your office if you need to improve your local SEO. By no means should you use an 800 toll-free number. It should be a direct number to reach your business and should also include the area code. Refer to the image above for the correct way to update your phone number for local SEO. Make sure you update your hours of operation correctly as well. In case you have seasonal hours, you will need to change this part when needed. Most importantly, avoid negative local SEO ranking by correctly listing the category of your business. You’ll need to choose a category that defines what your business IS and not what it DOES. For instance, you can list yourself as an “Italian Restaurant” instead of “Pizza and Pasta”, even if that’s what you make. To boost your local SEO ranking, you will need to describe your business and what it does. This is where you can actually talk about what you do; not in the category or name sections. The description can be about 150-300 words, readable, and not stuffed with keywords. For proper local SEO, the description can have relevant keywords but the entire description should make sense. Make it unique and as per the guidelines. Another important section is the photos, which can be crucial for local SEO and higher click-through rates. Google gives you the option to upload three photos – profile photo, logo photo, and cover photo. These will appear in the search results and if they’re attractive enough, may compel many searchers to click on the link. For the sake of better local SEO, make sure the images are of high quality and are accurate. Here’s how they’ll show up. At 13%, reviews may be fifth in the list of overall ranking factors, but they shouldn’t be ignored. 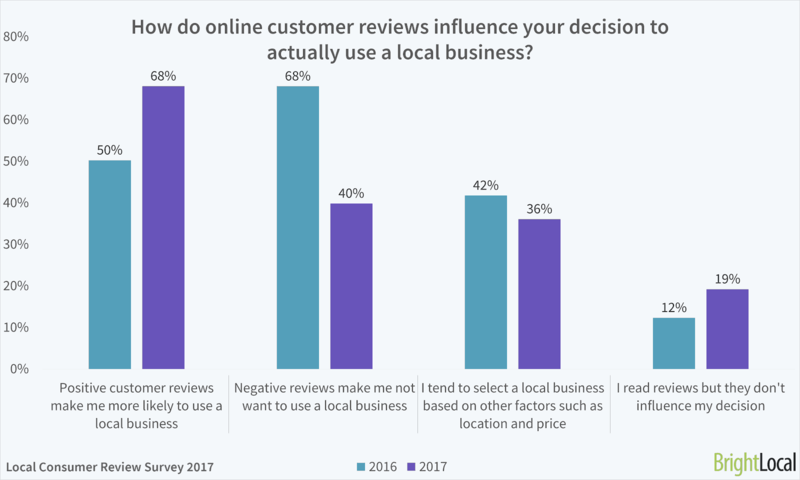 According to a BrightLocal survey, 85% of consumers consider online reviews to be just as good as personal recommendations. Online reviews influence the way people react to your business. That makes the reputation of your business an incredibly valuable asset – one not to be ignored. And Google knows that. Which is why they allow customers to rate businesses and leave a review for their listings. These reviews can help make or break your business. Obviously, you want to deliver the possible service you can to your customers to source positive reviews. The trouble with that, though, is that not a lot of customers tend to leave reviews for the businesses they engage with. That said, how can you source more reviews? The simplest way is to ask your customers to review your brand and products or services. Train your staff to ask customers for their valuable feedback when checking them out. You can also find review templates online that you can give your customers. These handouts contain instructions on how they can leave your reviews online. Another aspect to consider is when and how you should respond to reviews. To answer the first – promptly. As for the second, if it’s a positive review, then thank them for the compliment. On the other hand, if it’s a negative review, take it in stride. Be polite, apologize, and ask them how you can improve your services. This section significantly impacts your local search ranking. The title needs to contain the basics such as city and state along with the keyword. It’s important to arrange these words correctly even if you need to prioritize on them. The idea is to avoid making them look spammy, which can harm your local SEO efforts. For example, you can use something like “XYZ Sacramento SEO – Digital Marketing Experts in Sacramento, CA” as opposed to something like “XYZ Sacramento SEO – Best Sacramento SEO Service”. The latter sounds spammy and out of place. You already know that the content on your landing page is a crucial part of your digital marketing strategy. It needs to be unique, relevant, and useful for readers. At the same time, optimizing it with top-ranking keywords can help improve your local SEO efforts to a significant extent. Keep it at about 300-500 words and divide the content up using sub headers to make it easier to read. Just like in Google My Business, the business information on your website should also be accurate when you’re optimizing for local SEO. Follow the same rule mentioned earlier i.e., use correct business name, avoid 800 toll-free numbers, update correct address, etc. Make sure you prominently display information about your hours of operation. This is extremely important for local SEO as nearly 97% of consumers used the internet to look up local businesses. The BrightLocal survey mentioned above compared the frequency with which people looked up local businesses. This is extremely important for local SEO as 54% of smartphone users conduct a local search to find business hours, according to Google. These are the basic ways to optimize your website for local SEO. However, you also have other options to further optimize it. For instance, some effective techniques are including customer reviews and testimonials, optimizing image size, optimizing image for search, decreasing page load time, and optimizing the site for mobile. Use Meetup.com to find local events that are relevant to your industry. Contact those with websites about sponsorship and if they accept, you could get a linkback from their site. To take your local SEO to the next level, you also need to build citations manually. Your aim should be to get listed in three types of top directories – national, industry-relevant, and local. Make use of tools like BrightLocal, which will show you your existing citations. You can then update and improve on them while keeping local SEO in mind. Some of the best directories you should aim for include: Yellow Pages, Yelp, Facebook, Better Business Bureau, FourSquare, Linkedin, and Yahoo! 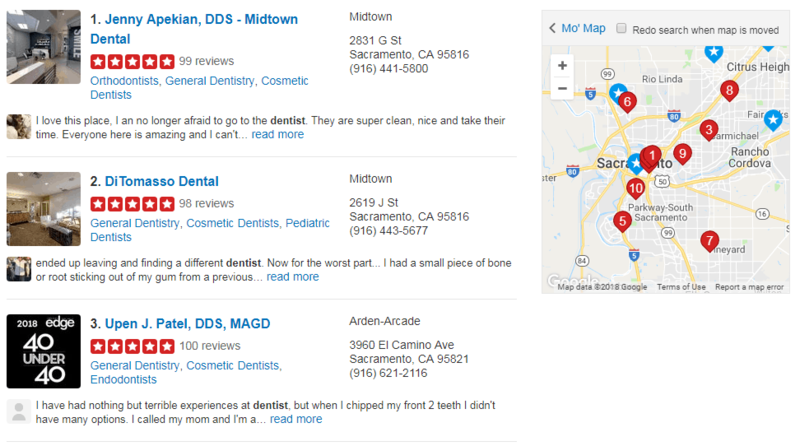 Take a look at the listing for Sacramento dentist on Yelp. Another important thing to remember in local SEO is to analyze your existing backlinks, which will help you identify spammy links and get rid of them before it’s too late. Since linkbacks play an important role in local SEO, you will need to ensure that the website has a healthy link profile. 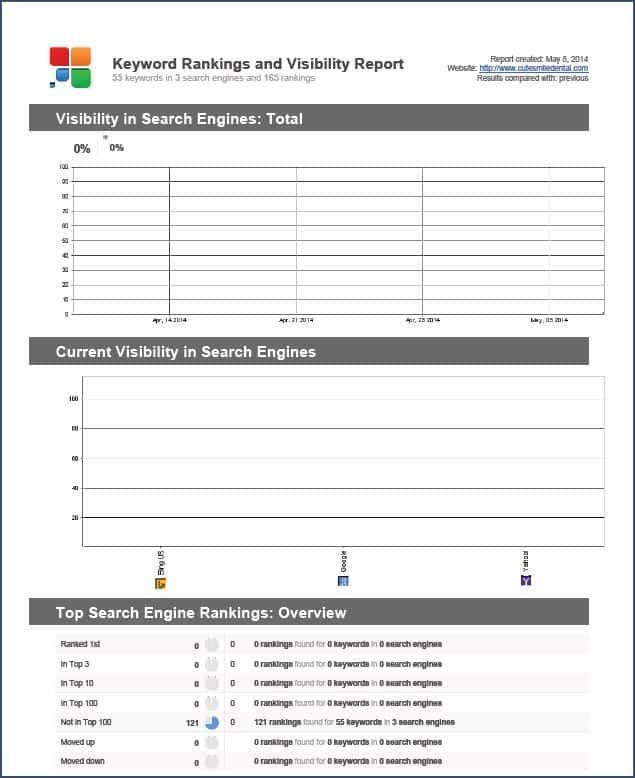 Make use of tools like SEMrush and Moz Open Site Explorer to get a clear idea about the link profile and document any domains that look unusual. Unusual-looking sites may consist of gambling sites, overseas domains, payday loans, etc. To improve your link profile for local SEO, you can contact the site owners to remove the linkback. Otherwise, you also have the option to disavow links. This means that you’re telling Google you don’t want anything to do with the site, so the search engine won’t consider these backlinks when crawling your site. Disavowing bad links could drastically help with local SEO if you have several suspicious sites linking to you. A Marketing Sherpa case study on local SEO determined how there was a massive increase in revenue with the help of geo-targeted keywords. The case study involved Hauser-Ross Eye Institute & Surgicenter, a regional eye care provider in Chicago and needed local SEO to build visibility and increase sales. While keyword categories like cataract, optical, cosmetic, and Lasik were relevant; the competition was extremely high in these categories. The team instead decided to use relevant phrases combined with a nearby location with an aim to improve local SEO. They inserted these location names throughout the site with an inclusion of towns and suburbs located within a 45-mile radius of the office. They also undertook the improvement of other on-site and off-site local SEO ranking factors such as link building, metadata optimization, etc. The result was an impressive 333% growth in year-over-year revenue for the business. 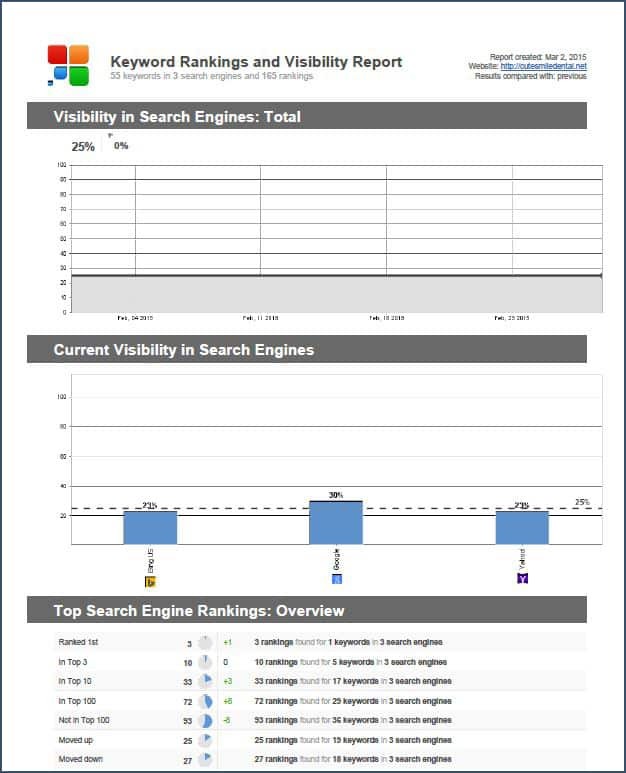 A local SEO case study by Brand Dignity showed how on-site optimization should be prioritized over off-site optimization like link building and citations. This applies to both local SEO and regular SEO. According to the study, the client – Cute Smiles – had all their services listed under one service page. There were no inbound links, individual page meta data, and image optimization. There was low keyword usage in website copy and they hadn’t even claimed local citations that had wrong information. With local SEO gaining more and more importance every year, it goes without saying local businesses need to prioritize on optimizing their websites and My Business pages for local SEO. Make use of the facts, tips, and techniques covered in this article to boost your local ranking and take your local SEO campaign to the next level. 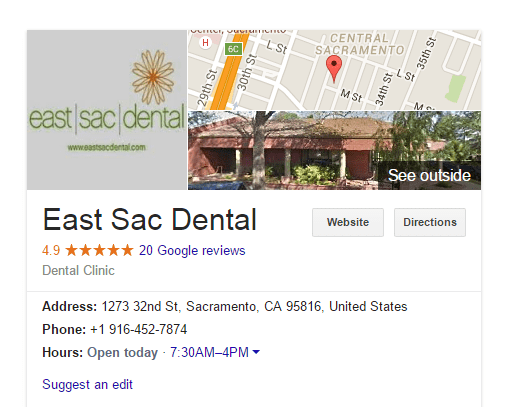 Whether you’re a Sacramento SEO expert or a dental clinic, you can use these ideas to improve your local SEO campaign. From identifying negative local SEO ranking factors to identifying the positive ranking factors, you now understand what aspects are harming your local SEO. You now have a clear idea how to optimize your My Business page and optimize your site according to the requirements of local SEO. Make the most of these ideas and elevate your local ranking. I’ve also created a useful infographic to help you understand and optimize your local SEO ranking. Check out the Local SEO Guide infographic below. Got any questions or thoughts about local SEO? Feel free to leave your comment. Is Machine Learning the Future of SEO and 6 Ways to Stay Compliant! Did You Know That Your Click Through Rate Could Change According To Your Business? Hi, Shane. Great article on local search. This brings along it’s own set of challenges beyond “overall” search as you refer to it. 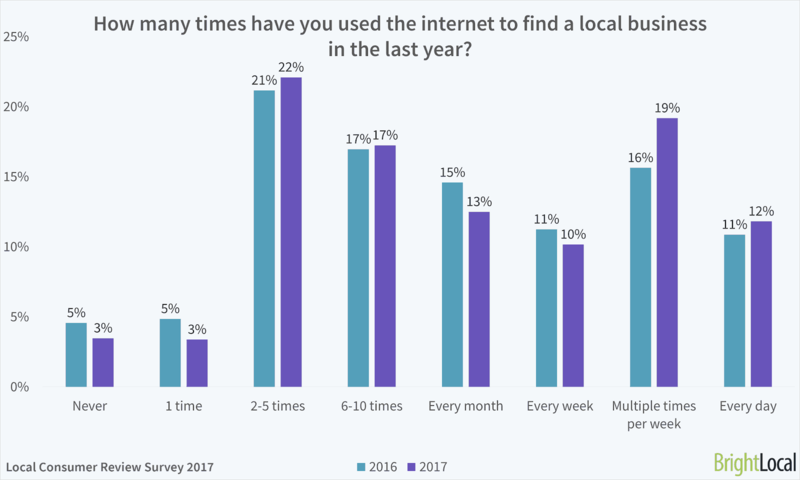 Google’s focus the past couple of years to provide a better local search experience has increased the competition among local businesses to be found. Following the advice laid out in this article will help any business in bringing more customers to their doors. Hey John….glad you enjoyed my article! Stay in touch my friend. Really appreciate this article. I’ve spent many hours today and read many articles on how to rank locally. This one was by far the best, and most comprehensive one. I was impressed! Will this negatively impact SEO on google my business? What about in the website domain name? Hey Jason….I’m glad you loved my article! My answer: There is a big debate about whether an EDM (Exact Match Domain) is good or bad for SEO. I can tell you first hand that I have used EDM’s in the past and they ranked very well for my clients. Google says it doesn’t matter (good or bad) for SEO these days but I don’t think that is true, as I think they still rank better. If you want to use MiamiRoofingContractors.com and your business is Miami Roofing, then go for it. If your name is ABC Roof Repair and you want to use MiamiRoofingContractors.com then you can use it strictly for a 2nd lead generation source (as long as you are located in Miami or do business there). Hope that helps.